Edenmore Nursing Home welcomed local singing legend Terry Charles in to the home for a Valentine’s Day spectacular, a particularly special day for married family members Margaret and Gerald Bailey. 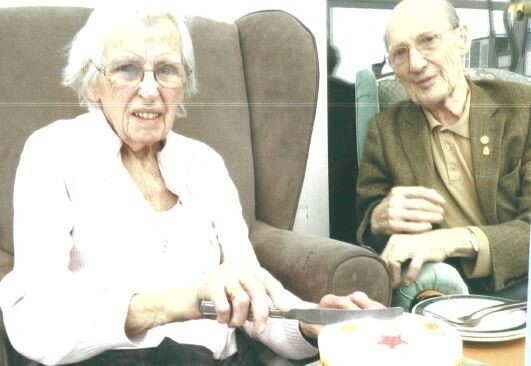 Margaret, known as Ellen, and Gerald Bailey have known each other for an astonishing 85 years, first meeting in 1933 when they were just 7 years old. They first crossed paths when Gerald’s parents bought a grocery shop in Ilfracombe and Ellen just so happened to live on the same street. They became Mr. and Mrs. Bailey in 1952 after a joyful ceremony held at St Peters Church in Ilfracombe and will celebrate their 67th wedding anniversary in March. Ellen and Gerald, along with other people living at Edenmore, enjoyed the musical talents of Terry Charles who is a part of the local band ‘The Grumpy Old Men’ - an integral part of North Devon’s entertainment. Terry plays 50’s and 60’s music along with some country and reminiscent numbers, there’s a song for everyone which is why he is welcomed back at Edenmore time after time. Why Doesn’t the UK Have a Women’s Equality Day? Wendy Mills, in Frome Nursing Home, and, pictured right, about to break the sound barrier. The 26th of August was Women’s Equality Day but only in America. In the UK the date is meaningless because we don’t have a day set to celebrate women’s equality, despite British women wining the right to vote over 100 years ago and having had a female Prime Minister for 11 years. 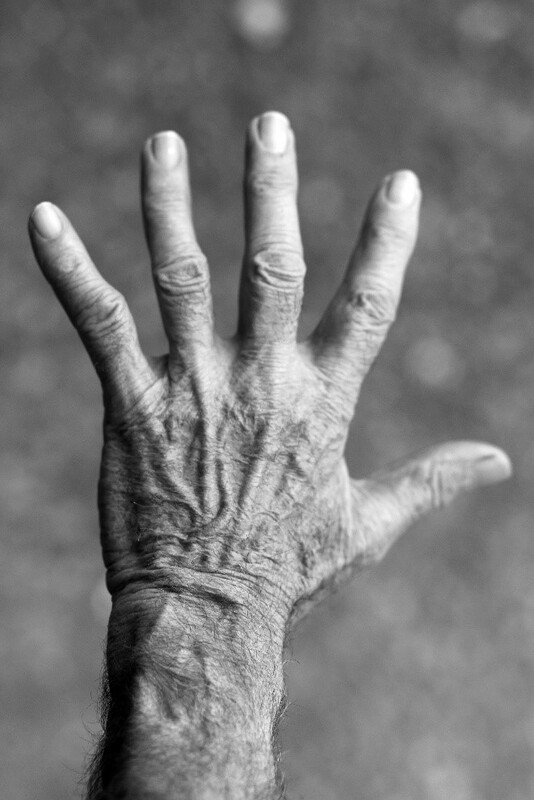 I wanted to speak with someone who had lived through many decades of discrimination and learn what they thought about this, so I started researching Nursing Homes in the South West, to find somebody who was both the right age, and had a powerful story to tell. I found that person in Frome Nursing Home. One of their residents is 84-year old, Wendy Mills. Frome refer to all their residents as family members, and after I explained the reason for my visit, Wendy was keen to talk with me. As a child, she had watched the Battle of Britain in the skies over her childhood home in London and grew up determined to become a pilot. 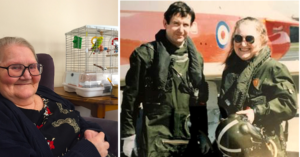 As soon as she was old enough, she applied to join the Royal Air Force but when she asked about flying, she was told point blank, that they didn’t accept female pilots. She was angered and disappointed but didn’t let her frustration show. She went on to do her basic training in North Wales before going on to work as a fighter plotter, who are those women you see in war movies, pushing model aircraft around a map, with sticks. This was during the Cold War years when there were regular incursions into British airspace by Russian bombers, usually coming in over Scarpa Flow. Wendy and her team would scramble fighters up to intercept them. Her shifts could last 36 hrs, meaning she slept and ate underground, in a top security bunker in Norfolk. The job was onerous because the aircraft were sometimes carrying nuclear payloads. Before her shifts, she told me she would walk in the fields around the bunker, filling her nostrils with the scent of vegetation, because if a nuclear war did ensue, it may have been her last chance to experience that. She did well in her post and was soon promoted to Flight Sergeant, but she never lost her yearning to fly. One day, she noticed a magazine advert for women to join the RAF as air-crew. Eagerly she took the magazine across the airfield to where the flight crews were based and knocked on the commanding officer’s door. She waited nervously before being invited in. She presented the magazine and explained that she was requesting flight training and had thought of little else since she was a child. The C/O smiled and carefully read the piece before leaning back in his chair and telling her that she’d need to pass a medical exam and get permission to fly, from her own commanding officer. A few days later she presented him with both. The C/O smiled, stood up and told her to follow him. They walked into a large room, where the aircrews sat around smoking and drinking coffee before their missions. 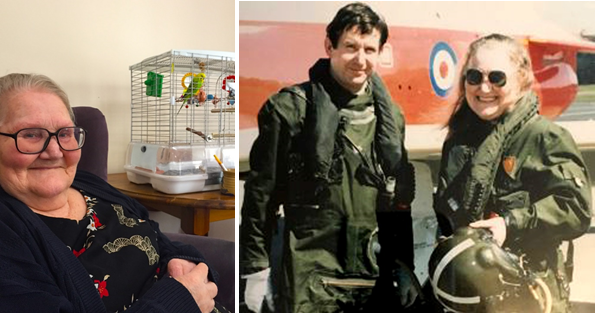 He introduced Wendy as their first female air crew member. The place erupted with cheers and whistles. Wendy’s eyes twinkled as she tells me this, the memory still fresh in her mind. Although women could be air-crew members in 1958, they were not allowed to be operational pilots for another 34 years. In 1992, long after Wendy had left the RAF, the government finally announced that women would be allowed to fly military jet aircraft. But what had happened to Wendy? She left the RAF, to get married and start a family. She went on to work as a successful aviation journalist for the Yorkshire Evening Post and spent her first month’s wages on flying lessons. It turned out that she was a natural and quickly passed her pilot’s licence and then became a flying instructor and then a flight examiner and taught flying instructors how to teach. She continued to write aviation stories, including one memorable piece when she flew faster than the speed of sound, as a co-pilot in a 2-seater Phantom jet fighter. Impressed by her remarkable story I asked Wendy if she thought the UK needed a Women’s Equality Day. She sighed before turning to me. I do, Wendy, I do. Suffragist, Millicent Fawcett, said, “Justice and freedom for women are worth securing, not only for their own sakes but for civilisation itself.” It seems that millions think we should have a Women’s Equality Day. Last February 6th was the centenary of women getting the vote, so surely that would be an ideal date, but it does beg the question, why don’t we have one set already? In a Nursing Times survey in 2014, almost 60% of staff consulted, indicated that they thought uniforms were an important part of the job. It is, like the uniforms, a multi-layered topic that generates strong opinions. The Evolve Care Group run 6 care and nursing homes across the South West of the UK, employing some 450 carers and offering over a million hours of specialist care, over the last 14 months. Four years ago, they started discussing the pros and cons of not wearing uniforms. 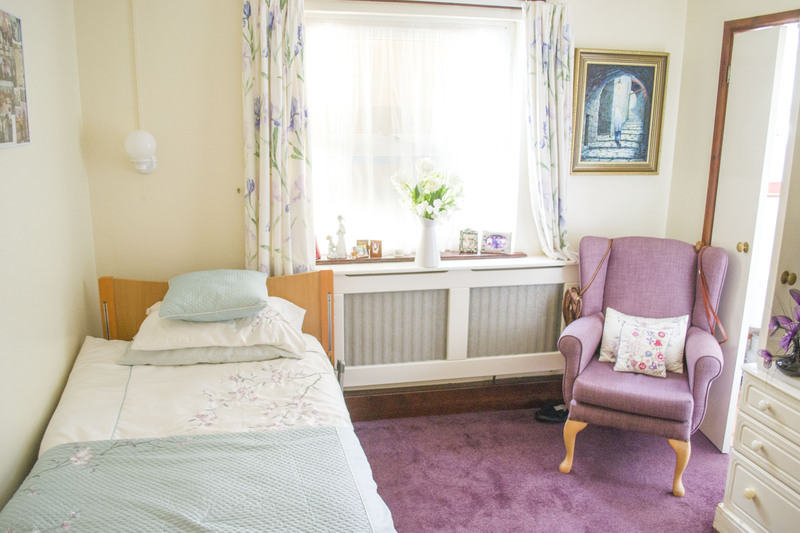 After careful consideration, they decided that this was a good idea because it was in line with their Household Model of Care and would help them minimise the institutionalisation seen in their care homes. 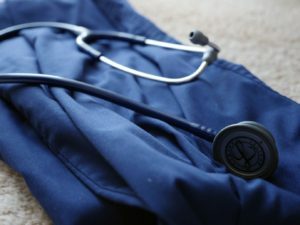 They announced to their Care Teams across the company, that they no longer needed to wear a uniform. By and large, the teams were delighted, but a few carers argued against it. One said that she thought that uniforms were important because they were respected, and it simplified identifying senior carers. At the time, Health Care Assistant, Rose Pearce, from the group’s Gibraltar Nursing Home in Monmouth, said visitors needed to quickly identify who they could talk to about important care issues and argued to keep the wearing of uniforms. Talking with her recently, however, she has changed her mind, completely. She also noted that the care staff and family members seemed more relaxed and began to realise how divisive uniforms had been, drawing a line between the carers and the cared for. Being able to choose what to wear for work also meant that staff were able to choose clothes to wear that would be more likely to generate a positive reaction, such as wearing a particular football top when working with a family member who supported that team, or wearing a T-shirt with a picture of a horse, and asking if anyone had ever been horse riding. Communication levels between carer and cared for, increased, as did the level of wellbeing. Although uniforms made it easier to recognise care staff, this was primarily benefitting visitors to the Home. For the family members, especially if they were living with dementia, seeing a uniform was not something they were used to seeing in their own homes and could increase levels of anxiety. Also, from the Care Teams’ point of view, uniforms could be uncomfortable and poorly designed, or cheaply made. It also seemed that some people had an antipathy towards uniforms. This may have its roots in our history of associating them with war or the emergency services or even school bullies. Nocturnally, the care teams were encouraged to wear night attire, such as dressing gowns and pyjamas, so that if a family member rose in the night and saw a carer in a nightie or pyjamas, this seemed normal, but had the carer been wearing a uniform, this could have become problematic. Evolve’s bold policy change has won favour with the CQC which recently rated one of its homes as Outstanding. Inspectors found that no uniforms promoted an “inclusive family environment” and minimised confusion for people living with dementia. Watched by 300 million viewers in 200 countries, and with 500,000 spectators in attendance over the 2-week period, Wimbledon is the largest annual sporting event in Europe, with the cheapest seats for the finals currently costing around £4000, if you can get them! It is much loved by audiences in the UK’s 11,300 Care Homes, too, with packed seats watching the matches in the build up to the Women’s final on 14th July and the men’s final on 15th. 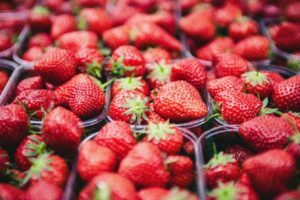 At Edenmore Care Home, near Ilfracombe, the residents, are referred to as Family Members, and have matches viewable in numerous lounges and may be served traditional strawberries and cream and perhaps even a glass of something stronger than tea, to celebrate the finalists’ successes. The home has a speciality in caring for those living with dementia, and watching sport is thought to have a beneficial effect on that condition. But what is it about this fascinating game that attracts so many viewers? Perhaps it’s our pride in our own tennis stars, or the fact that it is the most famous tennis tournament in the world. Or is it the out-and out “Britishness” of it all with the strict, all-white uniforms, Henman Hill, and of course, the Royal Box? When asked why they liked watching tennis, family members often cited the classic 1980 final between Borg and MacEnroe as the ultimate Wimbledon Final. MacEnroe saved 7 match points before finally losing to Borg in the 5th set. Roll on Wimbledon. Now where’s my scone gone? 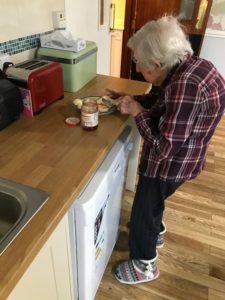 For most people, spreading a slice of toast with jam is a task that takes but a moment from our busy lives, but for Audrey Payne, an 85 year old, living with dementia, this prosaic act is unusual as is frowned upon by some care homes. Audrey resides at the Edenmore Nursing Home in Ilfracombe, where they provide award winning nursing and dementia care for 47 older people. They are part of the Bristol based, Evolve Care Group. They refer to their residents as “family members” and treatment is based on the six paragons of Comfort, Identity, Occupation, Attachment, Inclusion and Love. These are part of their “Household Model of Care” which aims to promote enablement wherever possible. One of the most confusing aspects that make living with dementia difficult, are changes to routines. Audrey came to Edenmore, in March, after living on her own for many years, and her former breakfast routine always included tea, jam and toast. Minimising change was considered essential if her care was to be effective, so she was carefully assessed to be capable of making toast and using a butter knife, without posing a risk to herself or to others. A staff member is always on hand, keeping a respectful distance away, but giving Audrey enough space to feel like her routine is unchanged. To foster inclusion, “Family members” are encouraged to eat together, sat around family style tables, in a relaxed way. To an observer, anyone watching Audrey’s slight smile as she carries her breakfast plate to her chosen table, her expression may not seem important, but it is not the look of somebody worrying about changes they do not understand. It is the smile of somebody looking forward to nicely browned toast, laden with scarlet raspberry jam. Two of the marketing team from Edenmore Nursing Home, in Ilfracombe, Devon, have just raised around £1000 for the Alzheimer’s Society in two sponsored tandem parachute jumps. 99% of those being cared for at Edenmore live with dementia and Alzheimer’s is the most common cause of dementia among older adults. 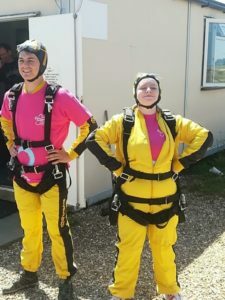 Jessica Caine and Luke Barnett took to the sky on Sunday 5th August, from Dunkeswell Airfield in Devon, and jumped, each attached to their instructors. They raised enough money to pay for 2 years’ worth of clinical trial drugs to search for an effective treatment for vascular dementia. Speaking afterwards, they said the day was a total success for both Edenmore Nursing Home, and for Alzheimer’s Society. There is a sport called Banzai Skydiving. You throw the parachute out of the airplane first and then jump out after it and put it on whilst freefalling. The world-record wait before jumping out is 50 seconds! Happy Mother’s Day to everyone who recently celebrated Mothering Sunday! We had a wonderful day here at Edenmore Nursing Home. We had so many beautiful bunches of flowers delivered from friends and family that perhaps live further away or that just wanted to send something extra special – we had enough to open up as a local florist! Everyone enjoyed a delicious Sunday Roast, and so many relatives and friends visited and celebrated with us. Our whole home was full of love! Mum’s are so special, and it was a fabulous day celebrating them, together here at Edenmore Nursing Home. Julie celebrates 30 years at Edenmore! Edenmore Nursing Home, recently celebrated it’s longest serving team member, Julie Balment. Julie joined the Edenmore care team on Christmas Eve in 1987 and has spent the last 30 years taking care of family members living at Edenmore. Julie originally came to work at Edenmore on night shifts when her children were young, and in 1989 her mum Carol joined the team and has also worked there ever since. At one point in time Julie’s daughter Hannah worked at Edenmore as well.